I think I’ll have to work on keeping my expectations low all year till the Europe visit happens. Because arriving in Port Fairy (formerly Belfast I just read) after end-to-end podcasts detailing WoW patch 2.4 features, and rolling into a street not unlike a poor version of suburban Glen Waverley, we found the most charming place imaginable at Garden Pavillions. The ramshackle garden plantings and screenings hummed with seachanger energy. Figs, apples and lashings of pea straw, New Holland Honeyeaters, and then finally the cottages – windows on all possible sides, the Bagshot that could have been. Awesome. They have Scandinavian-style leather adjustable chairs and a hot, hot shower, plus decent in-bed lighting. We just love it. It’s a charming little town really, like Beechworth right beside a cute marina. We spent a good few hours looking at every gallery and antique shop within 20k’s. Not buying a thing though – most unusual. I had to be persuaded not to buy a Victorian postcard for the ordinariness of it – far better an exotic S.A one in a few days time. Books are starting to get read and newspapers devoured; no internet is weird and unsettling for us both. I rediscovered a great magazine called The Monthly and finally gave Kim an idea for my birthday present next month. Meanwhile, she annihilates every hard-level Sudoku in sight. So nice to break some routines. Who cares if it’s windy and showery? It’s a damn relief this time of year. During some after-work drinks at the Mitre Tavern last week, I must have mentioned to Ash that maybe we should go overseas and travel for a bit. 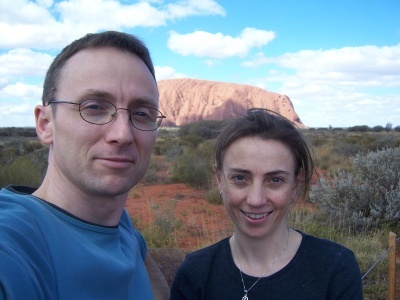 When Kim was unable to make it on the recent Ayers Rock flight, I was pretty ok with it, as we’d discussed her fear-of-flying and a possible bailout a lot beforehand. All holidays that include her are WAY SUPERIOR, but at the same time, I’ve been itching to go and see bits of Europe that I missed in 1987 for awhile now. I no longer have the independant streak necessary to go it alone, so the obvious choice was Ash. He seems keen too. At the same time, friend Dave from Columbus starts throwing around emails suggesting exotic events like a road trip to Canadian football’s Grey Cup in Montreal 2008, and I’m beginning to wonder what possibilities there might be. So, I need to write down the sort of things I’d like to do, and see if I can muster the required excitement levels. For unknown reasons I have found it harder in recent years to get enthused about travel, unless it’s to go to a specific event. Am I losing my once bountiful curiosity? Is this what working for a large corporation and playing lots of computer games does to you? Amsterdam is a must – and not for the reasons you might imagine. France and Portugal/Spain/Italy are high on the list because I’ve never been there before. I imagine the Zoch will be keen on Germany due to his heritage, and I’m all for it, given the great beer there. I’m unashamedly going to quaff every beverage going round. Perhaps when I look at what the costs are, it’ll be a reality check, but right now, I think it’s going to happen. Our mortgage is looking really well under control for once. Oct/Nov 2008 maybe? This weekend I flew to Yulara and saw Pauline my sister just 5 weeks before she ended her 1 year stay as a nurse at the Ayers Rock / Uluru resort town. 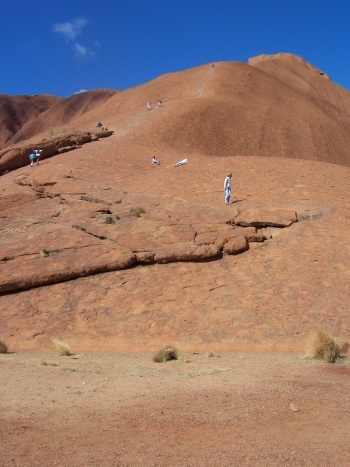 It’s a great place for a weekend, but it doesn’t surprise me that average length of stay for a vistor is 1.4 days, and for a worker seems to be 1-2 years, as there’s not a lot to do besides go to see the big rock (Uluru), or the little rocks (The Olgas). If you’re a fan of plants like I am, you get to see a wonderful array of arid habitat mulga, caesia and saltbush, some lovely river red gums in the stony creekbeds and spiky wattles, upright desert oaks and long-leaved hakeas. It was winter, so days were blue skied and almost windless, and nights were Melbourne-cold. I’d wake up in her small concrete brick bunker of a hut and look outside and find myself delighted by the light and red earth all around. And of course the majesty of the rock, which was about 10k’s away across the plain. We got along ok, and she’s pretty much the same spartan type as mum and dad, but prone to talking inane crap to fill in conversation gaps like I can. I didn’t know that she found singers like Pink empowering for women, or that she has only burped 10 times ever, so can’t drink fizzy stuff, or that as a guilty pleasure she occasionally ate prawns. Life would be hard for a vegetarian out there. Everyone in town seemed to know her and she presents as a really hard working, money saving type, who can still enjoy a red wine or 3. It’s touching the amount of photos of friends she keeps on her walls reminding her good times, and the effort she puts into contacting them. It makes me feel a bit bad about my lack of care there. All my life I’d wanted to go to this place and climb the rock, but when I read the signs from the local aboriginals asking people not to do it, I was happy to walk around the base (it’s 11k around the outside, so I didn’t go too far) and looked into the caves and waterholes instead. Apparently from a 85% climber base in the 1970’s, it’s now down to only 40% who climb. I’d love to see the Australian/Overseas ratio of that 40%, as I’d bet that overseas people are more respectful of the plea. For someone who spent two whole weeks in Indonesia, I have surprisingly little to say about it. I guess it was mostly a work trip, and that was my mindset a lot of the time. I wasn’t particularly adventurous in anything. I didn’t buy any souvenirs (except for Matt at work, who cherishes Oil Industry paraphenalia) or T-shirts (I have enough of those), and even my wife copped only a single pair of earrings. The one shot of Jakarta traffic that doesn’t contain 200 motorbikes coming from every possible angle. Organised chaos! I did eat a lot of the local food, and whilst it was very tasty, I missed silly things like some vegemite on toast for breakfast. For some reason this time of the day is the one where I resort to bland(ish) comfort foods, so thank goodness the hotel had great muesli. I just couldn’t come at spicy stuff at 6:15am. So, I had plenty of Nasi Padang, (a fiery Chinese Yum Cha equivalent with probably a lot less hygiene) and Nasi Lemak until I was sick of rice and went for noodle dishes like Mei Goreng because I knew I wouldn’t cop peanuts in that. I ate chicken necks in chilli but passed on the cow brains in sauce. There were so many soups on offer (despite the climate) but I was not as tempted as I would be in Melbourne at this time of year. 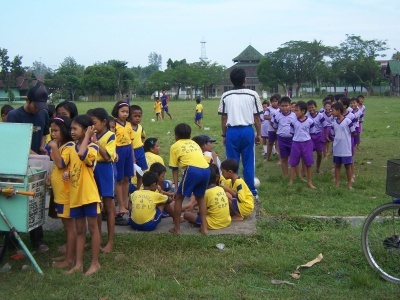 School kids exercising at 6:45am before lessons in Cepu. On the whole, it really is a wonderful place to visit – providing you don’t mind 2 hour traffic snarls, and a stack of black smoke from the most trashed and dilapidated public buses you’ll ever see. The people were just delightful, and I found the language an unexpected pleasure. If Kim flys again, I’d be happy to come back. 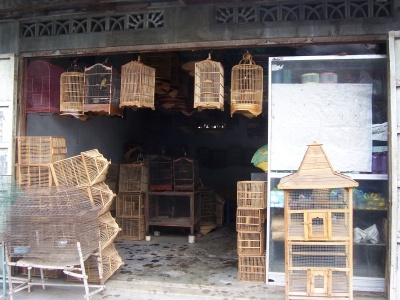 Swags of bird cages shops (and locally caught birds for sale) in Cepu. I know I should post some photos, but I’ve barely been outside the secured compounds of the hotel and workplace, and when I have, it’s been behind glass in a driver van. That’s how it works over here when you work for a large company. They worry about employees getting into strife at local markets or bars (or being robbed/kidnapped), so we’re banned from doing anything in the outside world unless escorted or without express permission. So, I’ve eaten a lot and used the internet every night. World of Warcraft gives me a ping time of 600-1400ms, so it’s fair to say I’m not at my best with that sort of delay. Not even close. As per usual, I picked up a chest cold from the flight, and this time the accompanying asthma has more severe implications, as the air is terribly polluted to the point of stinging eyes at times. I seem to be almost allergic to the environment – well, it seems that way because I get an itchy throat and ears pretty much every few days, and I can’t work out if it’s some low levels of peanuts (kachang) in the food or not. 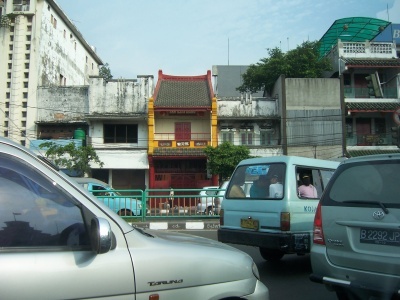 All the stereotypes of Jakarta are true – yes, you see families of 4 on motorbikes, yes the traffic is utter chaos (but it somehow works!) and yes the food is utterly awesome. The hotel is great, the beers have a weird taint that I can only attribute to regional waters used, and it’s absolutely normal to spend 1hr 45 mins in a car going to a party (like I did), only to return in 21 minutes. Speaking of that party – Dave and I finally arrived and went to head inside a really lavish affair feeling underdressed, when someone nudged us to the right into a doorway and we were in the oppulent surrounding of the real party. As opposed to wedding we had just tried to gatecrash next door. Oops. Pretty soon, a bunch of expatriates and wives arrived and a band started off some tunes followed by karaoke and plenty of red wine. Lithe asian ladies danced and sang immaculately, and the Indian host butchered John Denver’s “Country Road”, as did most others. (I was too shy). Tommorrow morning, I fly to Surabiya, and then catch a train for a few hours to a remote village. Should be really interesting. OK, I’ve succumbed. 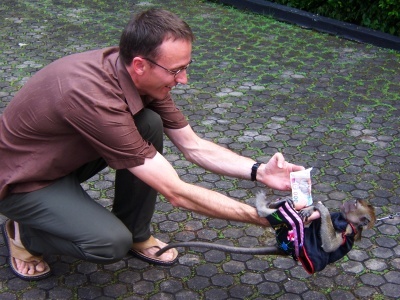 Here’s a trained monkey from the Taman Mini trip we did on the weekend. He just jumped onto my arm and hung on upside down. His owner controlled him on a light chain, and beat a drum to indicate which moves to make and when. He did some amazing tricks with a multitude of props including wearing an army helmut and donning a machine gun and crawling over the ground. I haven’t laughed that much in ages. I’m on a Singapore Airlines flight going to Jakarta, and I heard this little gem on an advertisement for (presumably) a financial services company – what’s it supposed to mean? On to other matters. Having a second hard drive in this laptop is terrific, so I’ve installed a few goodies and even tested playing WoW (workable). I think Bridei got the shock of her life this morning when I tested the wireless network at Tullamarine and logged in and whispered her. The headset is going to make daily chats a bucketload easier and cheaper, so long as my Shangri La room has broadband (please!). I brought a book about Indonesia and borrowed another called Affluenza, but for the moment they’re sitting undisturbed as I listen on superb noise eliminating headphones to a weird Asian classical selection on channel 05, and sip a glass of in-flight Tiger beer. Ahh…Business Class and its perks. With regret, there is one day of holiday left and unlike Kim I don’t want to return to the mayhem I already know is happening back there at work. Ash told me that they moved my office (and changed my phone number I suspect) whilst I was gone, so I should wear jeans the first day to unpack everything. And I will. 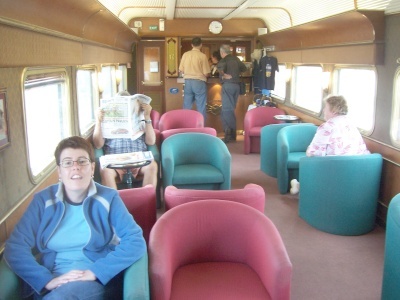 Lounge area on train. Scene of several German Whist triumphs. Somewhere along the line, I stopped posting about holiday things and returned home and got back to daily life, so this is my catchup. We had a fun time returning from the 24 hours of party that is Fremantle (not that we stayed out beyond 10pm) on the Indian Pacific, where we predictably sat with people in their 60-80’s every 5 hours in a wonderful dining carriage and made smalltalk whilst sipping wine and eating nice airline-style food. The first lunch, we met Audrey (whose name I had coincidentally mentioned to Kim as one I liked for a baby girl if that fertility thing ever works) who was visiting relatives in Sydney for a week. At dinner it was the Japanese couple of 72 and 69 who could speak little English, but liked Aussie beer, and asked polite questions. We got them again for breakfast, and then we decided new company was required, so we got some (gay?) German 50 year old Blues-enthusiast guys who were revisiting the country for the 5th time. 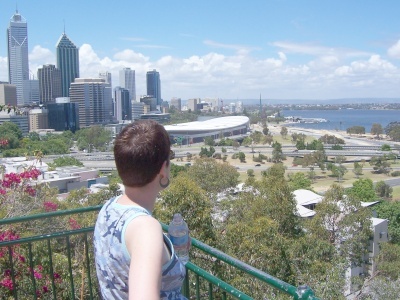 By the time we arrived in Adelaide we were starting to get sick of the meet-people-and-get-asked-when-we’ll-have-kids crowd, and we gratefully drank the worst coffee of the trip, and then tiredly drove home to Melbourne. Finally made it to sunny Perth. One of the most isolated major cities on earth – so they kept telling us. The garden had grown, and Kim’s mum seemed to have nearly killed a swag of my pot-plants but I didn’t mind. The dogs were jubilant – apparently tempermental Chloe spent several weeks sculking under the shed in a rage at the lack of attention she had been receiving. She seems to have reverted back to normal after a few walks and some extra affection, but she’s still a strange dog at times. We got back on the World of Warcraft, and resumed ties with some Crusaders of the Flame buddies. I booked a piano tuner and a haircut. We chilled some of my home-brews and drank them. We chatted to the guys fixing up our backyard and were surprised by how little they’d done whilst we were away. We revelled in the cheap Victorian prices for everything (coffee/booze/dinner) and were glad to be back in Bracks‘ dominion. And the election is coming up this week….hmmm. No, this is not a power struggle for the wheel of the Subaru, but a state-sanctioned sign that often appears outside wineries – it’s meant to make you think about who’s driving the car afterwards, before you’ve quaffed a pile of samplers, starting at the whites and working through the reds. Tommorrow we’ve signed up for a Wine Tour day from 11-5, so it must have worked on me. Not as big as Tassie, but hollower. On the way out of Pemberton, Kim did the Tree-top walk, proudly picking her way around the lady paralysed with fear on the second pylon – clinging to her husband in tears. The lack of birds, insect and wildlife in the canopy were a little disappointing. We visit the awfully named Jarra Jacks brewery for a sample rack of 6 delicious beers and a beautiful platter for lunch and then struggle with headaches later that afternoon. We are 40 metres up in the canopy, swaying on a tiny pilon, and trying to keep our feet. We are brave, even if it doesn’t look like much. Mostly disbelieving the mufti madness in the news this past week (since when have I thought credible some of the guff that’s been spouted by radical Catholics either), we’re really starting to get in sync and enjoy the break now. We’ve visited some very cute towns with cute shops and cute dark wooden houses (hello Bridgetown,Pemberton,Balingup). We imagine what kind of people must live in them, and whether they’re happy, or whether they just want to move to the city where the action is. 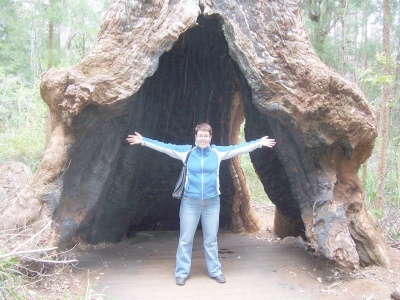 We wonder where the hermit of Nannup lives – the one we overheard a store-owner talk about, who makes a large piece of outdoor furniture out of pieces of fallen Karri timber and sells it to her when he needs some cash. Then disappears back to his bush camp again for months. Comments Off on Who is the Skipper? Today, I was stupid enough to try and feed a Kookaburra on the veranda of our A-Frame hoilday house in Denmark with some mixed seed in my palm, and it nearly took my finger off in confusion about which bit to sample. Undaunted, I sliced chunks of spicy peperoni up and watched the birds bang them against the railings to soften their prey before swallowing. Maybe they thought it was still alive? Feed at risk to your person. 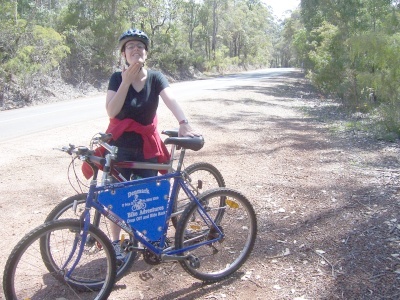 Later we hired dodgy bikes from an unflappable, lanky bushwalking type who dropped us 21k’sup Scotsdale Road at an Alpaca Farm that was run by a bossy teddy-bear wielding terrier named Fergus. Kim knelt on straw amongst tiny soft grey bunnies, patting away whilst the Guinea Pigs cowered in fear in the corner. 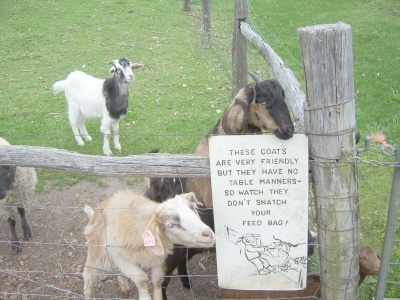 Goats and Kangaroos thrust themselves over and under wire to gobble mysterious pellets given to us in lolly bags by the owners. We rode into wineries along the way and became instant talking points, sampling mainly crisp green Rieslings or Pinot’s playfully described as having barnyard or forest floor flavours. Pretty soon, riding undulating hills on crap, rusty bikes became a chore and we staggered past a Steiner School back into Denmark in the teeth of a freshening southeasterly with lists of wine to try in future. We played German Whist later in the evening, and it was astonishly close, and I won’t reveal who won. Crap bikes. Where’s that Shogun Mach 3 from home when I really need it. It had been several days since her last retail experience and I was getting crabby about the expensive accomodation, my awful Franzen book and the relentless driving and moving every second day. So we had a few more in-car skirmishes whilst we set out for the incredibly hostile and remote Fitzgerald River National Park. There are few times I am asked to perform a brave manly act in our relationship, and I’m not talking about the strip-teases in the bedroom, but on this day I saw a large brown snake lying across our path at Point Mary and after making reassuring noises I walked past where it disappeared and watched Kim run past with unaccustomed vigour. 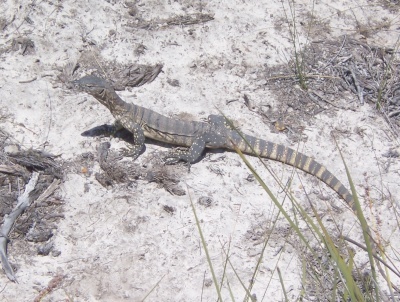 We came across a leathery monitor afterwards, who let us get a great photo. This the monitor we spotted a few minutes after the snake. We climbed West Barron Peak in gusty conditions and retreated to the car, pleased to have done some physical activity for once. Tough spiky banksias and Royal Hakeas were everywhere, so we stopped on the side of the road and took photos without daring to cut ourselves walking through it all. We rewarded ourselves at the Bremer Beach Pub, a surprisingly civilised place with Carlton Black on tap, and some quenching Coopers Pale Ale, whilst a local dreadlocked shearer swore and bitched to a lady friend about an unknown foe.